On behalf of the Winform Team, we would like to Welcome You to the Winform Online Bookshop. There is no need to sign up or log in to make a purchase. Please search through our categories in the side frame, and order an item by typing in the number of products you'd like to buy, make any choices necessary in the drop boxes, then click on the shopping cart button to add it to your sale. When you've chosen everything, just click on the checkout button and take it from there. 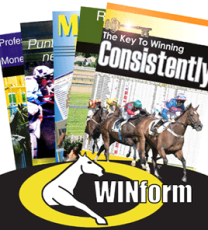 This shop contains all of the Winform products: we have books by many authors, software designed to help you win more, and our Trial Ratings sections allows you to sample our ratings before committing to a longer period. All items in this store have been checked by our editorial and form analysis staff and have been found to be reliable and genuine products. They can be ordered by email or direct mail and we accept Mastercard, Visa or AMEX as well as cheques and money orders and direct deposits and PayPal. Please make cheques or money orders payable to Winform Publishing. Disclaimer: The publications presented in the Winform Bookshop are copyright and may not be reproduced except for personal and by all public libraries which have the right to download hard copy for their members. None of the information or images contained in the Publications may be reproduced in any commercial form whatsoever nor are they for sale. The information provided is believed to be accurate at the time of printing however no responsibilty nor liability for the use of any such information can be accepted.